The Xebex Air Bike AB-1 is a high-quality competition-ready air fan exercise bike that’s built to withstand intensive use. The Xebex Air Bike features a heavy-duty 24” fan wheel with a chain-drive system and an unlimited air resistance system to give you a challenging workout. Air resistance works on the premise that the faster you pedal, the harder the resistance will be. The Xebex Air Bike enables you to work both the upper and lower body simultaneously. It features extra-heavy-duty handlebars to give a more intensive upper body workout, while the supplied foot pedals can be swapped out for optional SPD Cleat pedals if required. This air bike also features knurled foot-rest-pegs, offering greater traction and security. Ergonomically designed, the Xebex Air Bike’s saddle is fully adjustable to suit different rider heights. It adjusts up/down and fore/aft and also tilts for a custom fit. For added comfort, the saddle is well-padded and features a sweat-proof design. A straightforward-to-use workout console is included with the Xebex Air Bike so you can track your workout stats to help keep you motivated. Competition ready, the console uses the same formula that was used in the 2015 CrossFit Games to measure distance, watts, speed and calories. 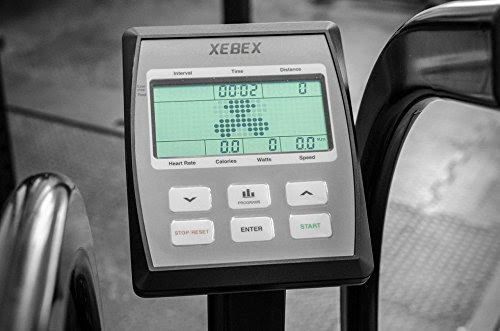 The Xebex Air Bike’s console displays pace/time, speed, distance, watts, calories and heart rate. You can set goals such as distance time tracking, target time, distance, calories or heart rate. Simply set your goal and the console will count down, displaying the time you have left to achieve it. There are a variety of workout programs to choose from with the ability to customize programs to suit your own needs. Choose from programmable interval functions such as tabata intervals as well as work and rest programs. 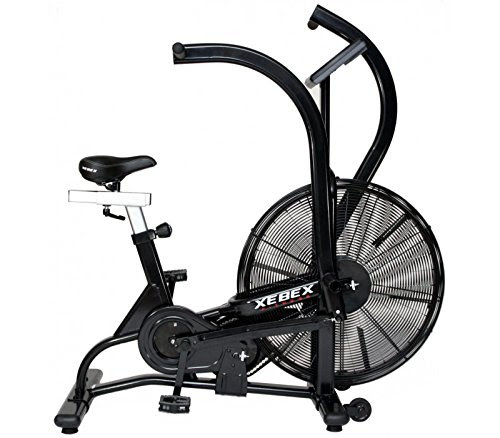 The Xebex Air Bike is solidly constructed with quality components for long-lasting durability. It features a sturdy 104 lb frame with sealed bearings and universal ball joints for added strength and stability. This air bike incorporates front-mounted transportation wheels for easy relocation. Confidence in the quality of the Xebex Air Bike is reflected in the manufacturer’s warranty: 5 years on frame, 2 years on parts. 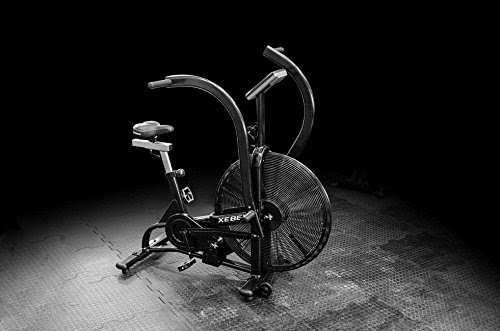 The Xebex Air Bike is designed for serious athletes looking for a more intensive total body workout. It’s very well constructed for long-lasting durability and fully adjustable for a comfortable fit. Exercise bikes in general offer an effective low-impact workout that’s easier on your joints compared to many other forms of exercise. Exercise bikes can help you to tone up, burn calories, increase cardio and generally help to improve your overall health and fitness. *Prices/discounts indicated are correct at the time this article was written/published. E&OE.